A Wall Mountable & Portable Storage Caddy All In One! Keep all of the stuff you use most often right at your fingertips, in one convenient storage caddy. This unique device can be stored on any flat surface, or is easily wall mountable. Place it in your closet, under the sink, in a cabinet, or just on a convenient place on the wall. It is not necessary to mount it, but if you do, the EvriStor N More remains completely portable and easily removable. Just lift up, and the soft, integrated handle allows you to carry all of that great stuff to the place it is needed. 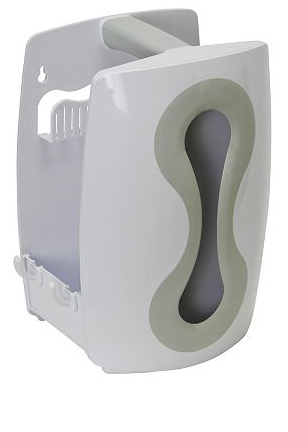 This storage caddy is perfect for cleaning supplies and other commonly used utility items. 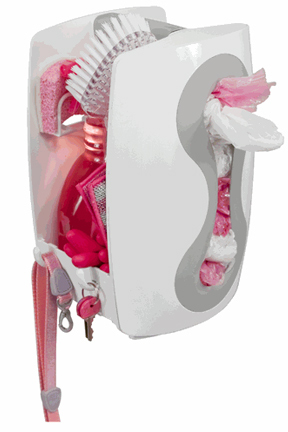 It has many hooks, compartments, and spaces so all of your items will be neatly organized and usable. Keep your recyclable grocery bags, spray bottles, cleaning rags, air fresheners, flashlights, brushes and more right where you need them, and be prepared for any tough mess that life throws at you. It even has a built in sponge holder, and integrated hooks on the sides that can be used to hang keys, leashes, dust pans and all kinds of other items. 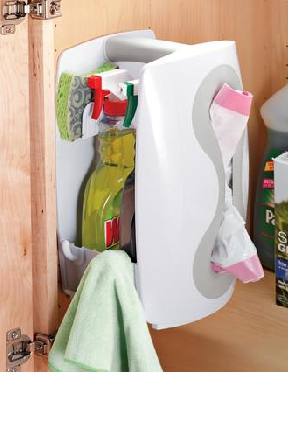 Perfect for the kitchen, bathroom, laundry room, utility closet or garage, the EvriStor 'n More Utility Caddy is a wall mounted storage unit and portable cleaning caddy all in one. No more juggling all of those cleaning supplies in your arms while you try to work. They'll stay neat and organized in this convenient cleaning caddy, which tucks away in the broom closet, laundry room or under the sink when not in use. When it's time to clean, just lift up and take it with you anywhere. It is super easy to mount, and all of the hardware is included, along with easy to follow instructions. Simply install the mounting bracket in an ideal location and you are all set. The EvriStor N More slips right on and remains out of the way until you need it. All of your supplies will be simple to find and easy to carry along with you as you work. You can just set the unit on any level surface for storage too. This means it can go on a shelf or workbench, inside a cupboard, or virtually any where else. It is not necessary to mount the unit to your wall in order to benefit from the organization and storage possibilities. This great caddy will make your cleaning faster and easier, but you can also use it in your mud room to stow pet toys and supplies along with doggy waste bags. 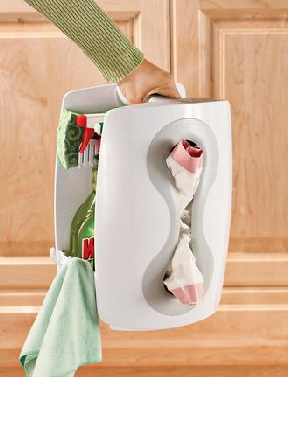 Mount it in the laundry room and it can be used to hold stain sticks, dryer sheets, rags, detergent and more. It can also be used in your closet to hold emergency gear like flashlights, candles, first aid kits, emergency blankets and portable radios. The EvriStor N More will add convenience and organization to any household. It is super easy to use and incredibly versatile. Order Yours Today! Dimensions 13.5" x 10" x 7"
EvriStor N More - A wall mounted storage unit and portable cleaning caddy all in one. Keep all of your commonly used stuff right in one convenient place.